We have introduced four new Time Clock widgets to Dashboard today! Total Overtime Hours - Shows combined overtime hours for a selected time range. Clocked In - Displays the total number of staff members currently clocked in. Pending Adjustments - Shows the total number of adjustments pending manager approval. 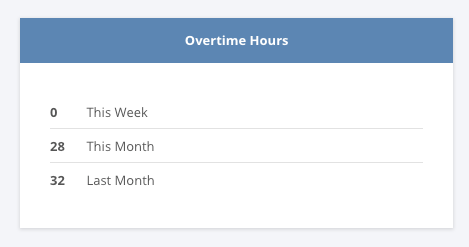 Overtime Hours - Displays combined overtime hours by This Week/This Month/Previous Month.